Are you going mad listening to your dog scratch, bite, lick, and chew constantly? Are either of you getting any sleep? Isn’t it heart-wrenching to watch your helpless dog suffer? 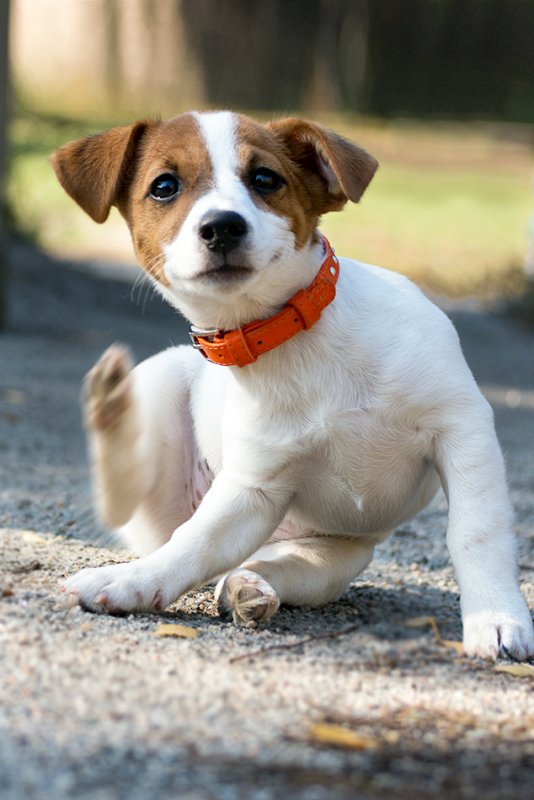 Dogs scratch, lick or chew for a wide variety of reasons. One of the worst offenders is food allergies or food sensitivities. (We now carry Dr. Dodds patented food sensitivity test. It’s not online yet so call if you’re interested). Other common culprits are parasites, yeast, pain and dry skin. But the bottom line is an itchy dog is not a comfy, happy dog. It’s more than likely a miserable dog. Just think for a minute about how it feels when you scratch a mosquito bite. It’s insane — the scratching makes the itch worse! You can claw a hole in yourself. Scratching irritates the skin’s mast cells which only serves to intensify the itch. It’s a frustration we’ve all experienced. Now put yourself in your dog’s feet. Your dog’s itching is broader and more profound because a dog has TEN TIMES as many mast cells as we do. Once the scratching starts, other mast cells close the itchy spot get irritated, so the poor dog digs at that. They scratch and then scratch more and more and more. They also roll and rub because they aren’t able to reach some of the itchy spots. Unless the cycle is interrupted, the constant trauma to your dog’s skin can cause severe damage. Self-mutilation is common, and existing skin conditions can spread. Repetitive chewing, licking, scratching or rubbing can also lead to infection, hair loss, hot spots, pain and compulsive behavior. Your dog can’t help it She’s going to keep at it until you do something. Stopping the agony is up to you. You need an effective way to kill the itch fast and stop the cycle from escalating without doing further damage to your dog’s health. No Itch Spritz is an itch relief spray like no other. It runs circles around other itch relief products — without using chemicals or steroids! 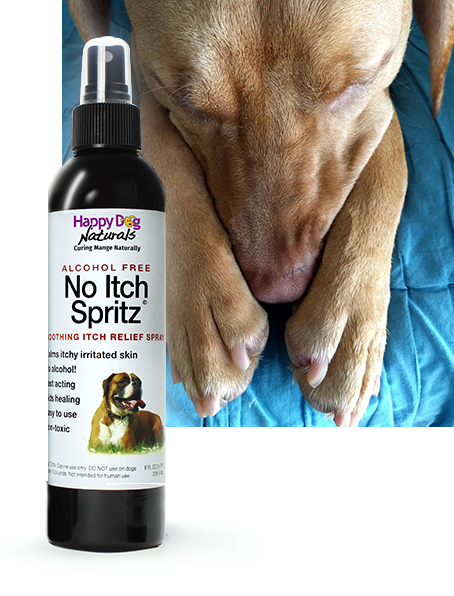 The second it hits your dog’s skin, No Itch Spritz kills the itch and numbs nerve endings to shut down the itch cycle fast! Not only does it kill the itch longer, it goes where other anti-itch products don’t. No Itch soothes, heals and works to stop future itching before it starts. We suspended production when the price of a critical essential oil shot up 1,400%. But prices are stable again and we’re THRILLED to bring No Itch Spritz back! Most brands rely on a couple of familiar ingredients to deal with skin discomfort. Not No Itch Spritz. Our formula is cram-packed with a slew of the top dog-safe, all-natural essential oils & botanicals that quell itching FAST. Instantly ditches the itch without steroids, drugs, chemicals of any kind, fragrances, colors, or preservatives or unpronounceable things often found in other products. Relaxing for all. No Itch Spritz is safe to lick off. Multipurpose. A gentle, therapeutic multi-purpose skin treatment Our natural formula also soothes discomfort and itching from flea bites, yeast, food reactions, hot spots, scrapes, scratches, cuts, fungus and other irritants. CLOVE- Clove is a potent pain reliever, instant numbing agent, and anti-neuralgic (relieves pain in the nerves, mainly caused by inflammation which very few things can do). Clove also kills more than types of 60 bacteria that can contribute to the itchies and is one of the most dynamic antifungals in the world against molds and yeasts. Plus, clove is anti-inflammatory, anti-spasmodic, the most powerful antioxidant on earth, and much, much more. LAVENDER – immediate itch relief, anti-fungal and antibacterial properties kill any fungus or bacteria responsible for itchy skin, notable anti-inflammatory and pain-relieving properties, calms dry skin and promotes wound healing. ROSEMARY – Soothing itch reliever that also reduces itchy scales and heals rough skin. 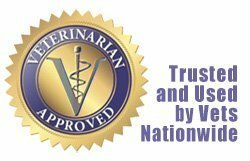 This effective antifungal and antibacterial kills any microbes responsible for the itchy, inflammation of your dog’s sensitive skin. TEA TREE – The go-to medicinal oil is for soothing skin conditions associated with itchiness. Because of its rockstar antifungal, antibacterial, antifungal, and antiseptic properties, tea tree oil can address the whole gamut of skin ailments. HELICHRYSUM – One of the best anti-itch essential oils for dry, itchy skin oil caused by both temporary discomfort and long-term conditions. Properties include antibacterial, antioxidant and natural wound healing activity. PEPPERMINT OIL – This cooling oil’s potent anti-itch properties help stop the itch immediately. Pain relieving, antiseptic, anti-inflammatory, peppermint addresses itching caused by dermatitis and other skin conditions. Even helpful for poison ivy and poison oak. LEMON – Natural itch reliever, soothes inflammation and helps reduce allergic reactions affecting the skin, anti-fungal, antibacterial, and antiseptic properties kill any itch-inducing bacteria on the surface. ALLSPICE – Rich analgesic that keeps the brain from registering pain or discomfort. Grapefruit Seed Extract – Helps heal flaky, itchy skin. Highly active against many itch-causing pathogens, including protozoa, bacteria, yeast and some viruses. No other known antibiotic exhibits such safety and versatility. Natural preservative. PURIFIED WATER – for our allspice and clove infusions. Five-stage filtration no less. 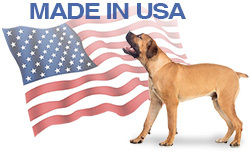 Because we think what doesn’t go on your dog matters too. Each pump bottle contains 8 ounces of liquid, and equals approx 1,425 sprays per bottle. This entry was posted in Cheyletiella Mange, Demodectic Mange, Mange Tips & Tricks, Sarcoptic Mange, Skin & Coat. Bookmark the permalink.